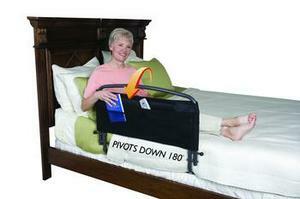 A bed rail is great for sleep safety and getting in and out of bed. Falls are a serious concern for the elderly. A fall can result in the need for additional care, medical expenses, and much more. Many falls occur at night, when seniors get up to use the bathroom, get a drink, etc. What are some things you can do to improve night care for your elderly? Step one: Eliminate the need to get up. A huge way to take care of your elderly during the night is to eliminate as many of the risks as you can. The best way to do this is to eliminate their need to get up and out of bed at night. For example, providing your senior loved one with bathroom assistance such as adult diapers, bed pads, bed pans, and the like, can help them avoid leaving the bed at night to use the restroom. You can also do things like invest in bedside organizers and pouches, to help create a place for things like medications, the television remote, and other things they may need at night, if they can’t sleep. Step two: Make it safe when they do get up. Rails- A bed rail is great for both sleep safety, and for helping with getting in and out of bed. Motion sensor lights- When a loved one needs to navigate their home at night, having motion sensor lights can really eliminate potential hazards. Or, consider using some night light plug ins to keep hallways and walkways illuminated, even during the night. Clear pathways- It is really important to keep pathways clear of items, including clothes, shoes, and other clutter, but also of furniture. Create clear, and intuitive pathways to and from the bedroom and bathroom, bedroom and kitchen, and anywhere else your senior loved one may need to go during the night. Independent living aids- Help make getting up and about at night easier with independent living aids, from canes, walkers, caddies, and more. You can find a wide selection of great products to help with night care for the elderly. Because a lot of emergency situations for seniors happen at night, it may be wise to look into a monitoring system that your senior loved one can use to keep themselves safe, even at night. If a senior falls during the night on a trip to the bathroom or kitchen, it could be several hours before any kind of help arrives. Fall protection monitors, as well as other safety options can help reduce risk and protect your senior loved one.